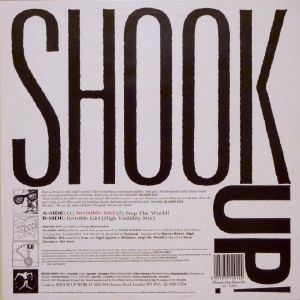 Irish Rock Discography: Shook Up! Neil and Ivan McCormick moved to London after Yeah! Yeah! split in 1985. 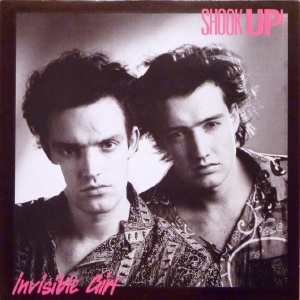 They found Vlad Naclas, Richard Ford and Steve Alexander through a Melody Maker advert and formed Shook Up! in 1986. They played a showcase gig at The Clarendon Ballroom in Hammersmith on 14 June 1985 which was video taped. Bill Drummond was keen and promised to sign the band with WEA (where he was A&R at the time) but this deal fell through. Shook Up! approached Mother about releasing "Invisible Girl" but it was vetoed for being "too pop". Ironically Yeah! Yeah! had earlier turned down the opportunity to release the first single on Mother a year or so earlier. They played another showcase at the Theatre Museum Covent Garden in was summer of 1988. After various trials and tribulations Shook Up! finally released their debut single in 1988, a 12inch on the Planet Pop label. It was slated by NME, received a lukewarm reception from Sounds, but was praised in Hot Press, Record Mirror and Record Week. Distribution was scuppered almost immediately when PRT went bust. The band rescued a couple of thousand copies which they sold themselves, but Shook Up! were no more, and the McCormick brothers parted company. Steve Alexander later found fame in his next band, Brother Beyond. See Also: The Modulators, Yeah! Yeah!